It’s been months since I last went to a Taco Bell, but I found myself in need of a quick lunch and decided to visit the Kapahulu one. The featured specialty items caught my interest, what they are calling “Cantina” style tacos. Soft corn tortilla tacos in either chicken, steak, or carnita fillings with chopped onions and cilantro. Each is roughly $2, and thats about all you get, a double soft corn tortilla with those ingredients, wrapped in foil, and a lime wedge. I have to give them credit for actually offering something that is more than just a rehash and recombination of their existing ingredients. I got a two pack of chicken and carnita. The chicken was quite dry, flavor alright. The carnita, being pork, was less dry, however the overwhelming flavor/spice seemed to be salt. Squeezing the lime into them helps, but after taking a few bites to sample the flavor, ended up putting on hot sauce. That drink is also some new thing, “Sparkling Limeade” or something to that effect. Pretty much lemon lime soda with some syrup that is the limeade component, and a lemon wedge. Not bad, but you don’t get much for the money. So the verdict? It’s something different to try than the usual whatever supreme, but ends up rather unexciting. And not filling. The more real mexican places have nothing to worry about. 2 out of 4 mexi monkeys. 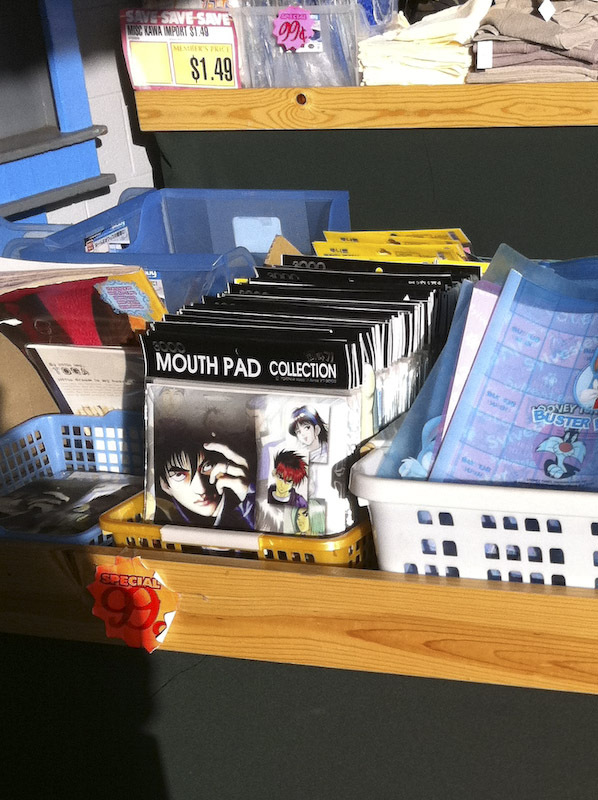 Does it work for optical mouth? 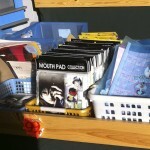 Discovered at Marukai, something all computer users should find useful, Mouth Pads! Holy cow, traffic trying to get back to office is totally messed up. State holiday has messed up the usual patterns. Gridlock & idiot drivers locking up intersections all over! Seriously, if you don’t have to be anywhere today, stay home. Between the State Holiday and the water main break on Ala Moana Boulevard, it’s like someone unlocked the monkey house and gave each monkey a car key. Similar to Clif Shot Bloks, these gummy energy blocks from the makers of GU gel are a convenient medium between energy gels and full-blown energy bars. The size and consistency are similar to the Clif Shot Bloks, but they seem to be a little less sweet. I’ve seen three flavors – blueberry/pomegranate, strawberry, and cranberry/apple. The strawberry and cranberry/apple have caffeine, but the blueberry/pomegranate does not (boo!). The packaging is like the original Clif packaging, where once opened, there is no built-in way to reclose the bag or otherwise keep the unused portion from escaping. If you don’t eat the whole 60-gram package at once, stash a rubber band to hold the package shut, or tear a hole just small enough to force a single block through and hope for the best. The caloric value is listed as 180 calories for the entire 8-block package, with 100mg of sodium total: The similar Clif product is 200 calories for 6-blocks with 140mg of sodium (for the non-sodium enriched flavors). 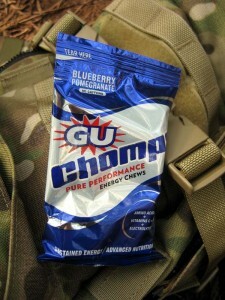 It’s pretty clear that the GU product was designed to be a direct competitor to the Clif one. 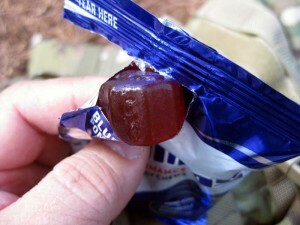 On a recent trail ride, I passed around a package of the blueberry/pomegranate flavor, and everyone in the ride group was positive about them. 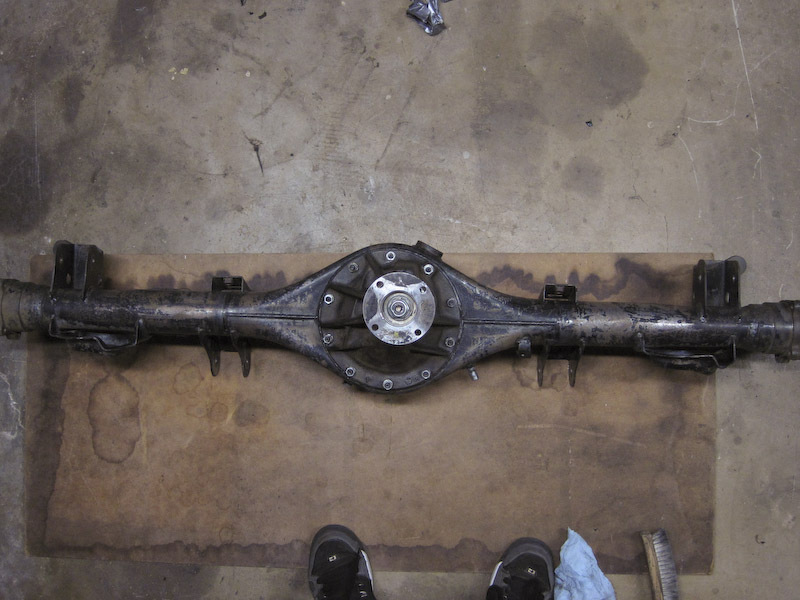 Last year, Root did a review on these also – click here for his review. Ckucke, Root, and I were pretty worn out from Sunday’s trail ride, but at JT’s insistence, we met up for a St. Louis drop with Kevyn. I relented because JT said it would be easy. The weather in the morning was terrible, so I thought maybe I’d get some respite from riding, but shortly after noon, the clouds dispersed, and the sun baked the trail again to dryness. To keep the muscle effort down, we stayed up on Mainline and went straight through to the rock drop trail after taco jumps. Descending to agave, we took the smooth, lower line out to the water tank, and stepped up to the rocky bypass above the concrete road. It seemed like we were going pretty fast in sections. Back at Kanewai, I talked with Cook Paul and my cousin, Mike, while Kevyn shuttled Ckucke back up to recover his truck. After ditching the bikes at Ckucke’s, we met Kevyn and Lorna for Vietnamese dinner at the top of Wai’alae. They got my order right this time. Cutter Mazda has their Demios (Mazda 2’s) in! Having missed riding over the weekend and Monday evening, we were all feeling the need for some dirt, so when JT instigated a Wednesday St. Louis drop, we were all in. Root, JT, and I piled into Ckucke’s truck, and we met Kevyn at Kanewai for the shuttle up. Although it had rained overnight and intermittently during the morning, the afternoon sun dried things out, so there was no trace of wetness on the way down through Dumps. At Agave, we climbed up briefly to the middle sortie and descended to the concrete road. Kevyn pinch flatted on the step-up after the water tank, so he had to walk it out to the street. 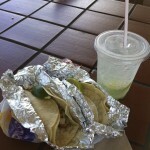 Dinner was at Serg’s in Manoa at JT’s suggestion. 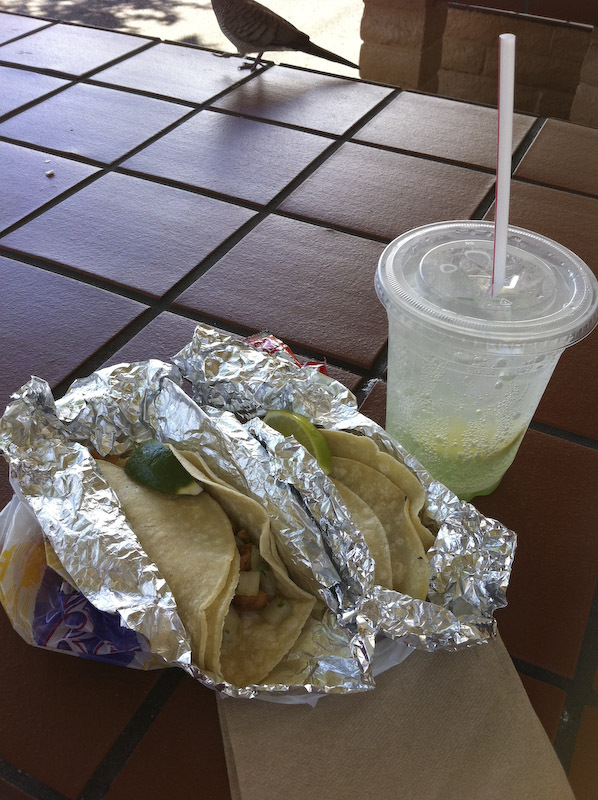 I had some good carnitas enchiladas with tomatillo sauce for about $10 USD (oh, and JT, don’t forget to give me $20! ).